When Lieutenant Colonel Spencer Thomas Vassall died at the storming of Montevideo in 1807, he left to his wife – Catherine Brandith Backhouse Vassall – and to his oldest son his 133 slaves. The slaves themselves were a bequest from his father. The Vassals, who hailed from London (mostly Stepney) from at least the time of the Spanish Armada, had extensive trading arrangements with the American and West Indian colonies. 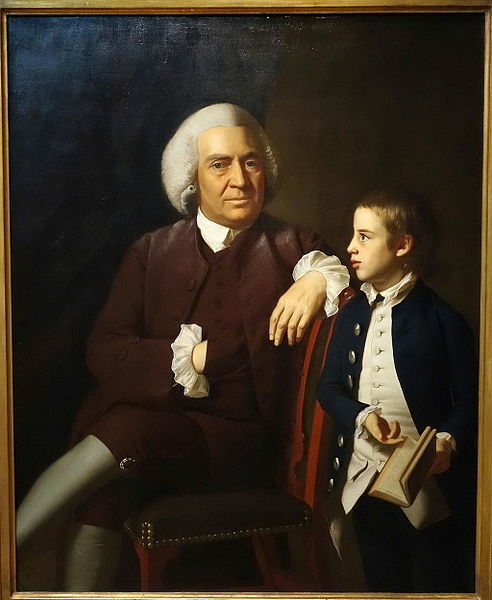 Spencer’s father, John, and uncle, William Vassall (pictured with his son Leonard) emigrated to Massachusetts where Spencer was born, but were driven out as Loyalists during the American War of Independence. John Vassall lost all his properties in the American mainland, but retained those on the Newfound River in Jamaica. Colonel Vassall may not have been aware at the time of his death of the abolition of the slave trade the previous year, but his family certainly knew of the abolition of slavery itself throughout the British Empire in 1834. By this time his wife had married again, to Thomas Chetham Strode in 1816. Strode was later a Deputy Lieutenant for Somerset (1825) and died in 1827. It was left to the widow and son by her first marriage to pursue compensation for the loss of the slaves under the Slavery Compensation Act. They were awarded the sum of £2,595 18s 5d. This was a substantial amount, being worth in excess of a quarter of a million pounds today. The total value may have been greater as there was another claim, arising from continuing sale and purchase of the slaves over the years, for the same property. However, a claim by Spencer Vassall’s uncle, William Vassall, for £3,870 19s 8d in respect of 198 slaves was unsuccessful. One small irony to modern eyes is that Catherine Strode was the daughter and co-heiress of a clergyman, the late Rev. D. Evans DD, rector of West Tilbury Essex and a sometime chaplain to King George III. Mrs Strode died in 1842. Having retained her home, Milford Villa*, Milford, she was buried at All Saints Church. * Milford Villa was renamed Belsito in about 1882 and demolished in the early 1960s.